The 50-50 joint venture takes some of the risk from the health system because the companies will equally share in the losses and profits. Despite widespread instability in the individual insurance market, the Cleveland Clinic is betting that a narrow network plan focused on keeping patients out of the hospital is just what the doctor ordered. The Ohio-based health system last week unveiled plans for a joint venture with New York-based startup Oscar Health. Cleveland Clinic/Oscar Health will offer individuals coverage on and off the Affordable Care Act's exchanges at a time when most insurers are jumping ship because of financial losses and uncertainty as they wait for the Trump administration and Republican-controlled Congress to make regulatory decisions. One of Oscar's founders, Joshua Kushner, is the younger brother of Jared and brother-in-law of Ivanka Trump. "If you put a product out in the market that is less like traditional health insurance and sick-care oriented and much more a consumer product that people want to engage with, that they like to tell their friends and family about, that pays them a dollar a day to walk steps and things like that, you are going to attract . . . plenty of 25- and 35-year-olds who just want to have good healthcare," Oscar CEO Mario Schlosser said. The plan will launch in 2018 in five northeast Ohio counties. The clinic will handle care delivery, and Oscar will provide the sophisticated tech platform and insurance operations expertise. The goal is to improve outcomes and keep costs down by putting patients at the center of highly coordinated care, the companies said. Plan members will be paired with primary-care doctors, physician assistants and other clinicians, as well as a concierge team made up of a nurse and three care guides to help the patient navigate the healthcare system. Each plan member will be paired with a Cleveland Clinic care team, including a primary-care doctor, physician assistants and other clinicians, as well as an Oscar concierge team made up of a nurse and three care guides to help the patient navigate the healthcare system. "Think about the basic insurance company's member experience. The only time a member deals with the insurance company is when the insurance company doesn't want to pay a claim," said Joel Klein, Oscar's chief policy and strategy officer. "There's nothing like this (plan) that's comparable." Cleveland Clinic has been flirting with entering the insurance business for years. The 50-50 joint venture takes some of the risk from the system because the companies will equally share in the losses and profits. 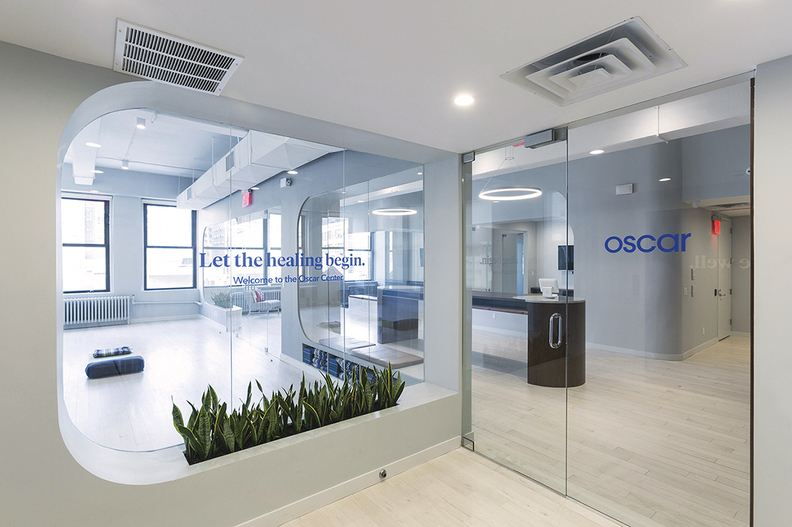 Oscar Health, which has struggled with financial losses in the past few years, gets to align itself with a renowned system that it hopes will attract enrollment. Oscar now covers about 105,000 people, and expects a few thousand to enroll in Ohio in the first year. The challenges of entering the individual insurance market aren't lost on the companies, which began discussing a joint venture in February 2016. Many insurers have jumped ship because of heavy financial losses and an unclear regulatory picture for the market's future. Health insurers have been filing rates in the past few weeks without knowing, for example, whether the Trump administration will fund crucial cost-sharing subsidies that help low-income Americans afford exchange coverage. Oscar has struggled with losses despite raising millions in venture capital. This year, it sold coverage on exchanges in California, New York and Texas. It lost more than $200 million on plans in 2016 and $120 million in 2015. Oscar previously pulled out of exchanges in Dallas and New Jersey, and recently filed requests with New York regulators to raise its individual rates in the state by 11% on average. Cleveland Clinic Chief Financial Officer Steven Glass acknowledged those losses, saying the health system analyzed Oscar to figure out its challenges and helped come up with a plan that both think would be successful in the Ohio individual market. Cleveland became interested in Oscar's focus on technology and user engagement back in 2012, when the startup launched. Cleveland Clinic later invested in Oscar in 2014. "We're not offering a conventional insurance product," Klein said. "We're offering something very different, something that the market and consumers have not seen, and we think that's compellingly attractive to people."